Sébastien Loeb Racing : One win, a one-two and some poles already ! 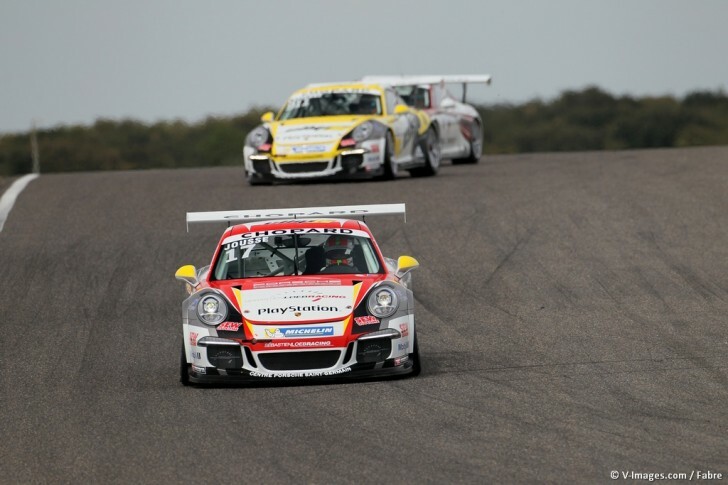 This weekend the four drivers of the Sébastien Loeb Racing competed at the circuit of Lédenon where was hosted the first round of the 2015 Porsche Carrera Cup France. Ambitions were high for this opening race and the different outcomes confirm that Sébastien Loeb and Dominique Heintz’s team is well-equipped and ready to fight in the various classes. After two pole positions respectively secured by Maxime Jousse in the overall rankings and Christophe Lapierre in the B class, the latter also clinched a win while Roar Lindland completed with a one-two. Unfortunately the team had no chance to improve those statistics as a heavy downpour forced the organiser to cancel the race on Sunday. On Saturday, Max Jousse began this new season just like the preceding one : in pole position ! Unfortunately for the French driver, a mechanical breakdown on his way to the grid prevented him from participating in the race and defend his chances. Lapierre then inherited the leading row in spite of himself. Largely dominating the B class, the driver from Montélimar succeeded in qualifying in first position alongside his leader and managed to assert his authority during the race. In two weeks, the next round in Le Mans will have to stand as a confirmation for Christophe and Roar, who is very close behind, and as a fulfilment for Maxime. As for Joffrey, he has showed his great top speed and reached one of the most promising Top-5 results thanks to a consistent race negotiated with much attack. While Maxime Jousse and Christophe Lapierre shared the first rows, Joffrey de Narda and Roar Lindland appeared respectively at the 5th and 6th rows on the grid. Unfortunately, the hopes of the former crumbled down during the lap on his way to the starting grid. Ideally positioned at the front of the pack, Lapierre was at the lead throughout five laps and honourably resisted the A-class drivers. De Narda moved down to the 6th row while Lindland solidly hanged onto the B-class’s second place. Occupying the third position overall up until the 12th lap, Lapierre damaged a steering tie-rod in the battle which pitted him against some of the best cars of the championship. Well under way to win the B-class race, his own priority, he safely made it all the way to the chequered flag before crossing the finish line at a fantastic 8th place. As for Joffrey, he climbed into the Top 5, only half a second away from the third step of the podium, while Roar secured a double for the Alsace-based team on the B class leaderboard. Les On Sunday morning, the qualifying session boosted Max Jousse’s spirits. He achieved a first row again, only 16 thousandth of a second away from the pole. Joffrey de Narda confirmed he felt in a good shape again, just like the day before, posting the 5th lap time, while Christophe Lapierre lead the B class within which Roar Lindland stood at the third position. The Sébastien Loeb Racing was unlucky as the heavy rain in Le Gard forced the committee members to cancel race 2. Next round in Le Mans on the weekend of May 2nd and 3rd.